What a transition! In Rouen, dogs are forbidden in public gardens, even on a lead. 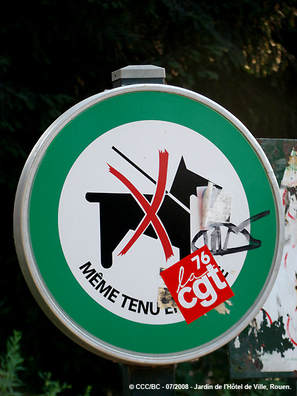 The CGT (Confédération Générale du Travail), one of the French trade unions, has put a sticker on this sign a few weeks ago, during a demonstration. It has not been removed yet. There are currently 172 blogs participating in this theme day: click here to view thumbnails for all participants. Williamsburg (VA), USA by ptowngirl, Willits (CA), USA by Elaine. I can't believe they don't even allow dogs on a lead. That is too bad. Great find for theme day! That is a really attractive "no" sign. The stylized dog and the colors the designer chose look very pleasing. The red sticker left from the protest makes the colors POP even more! Maybe the maintenance people tired of cleaning up after pooches.